Benefit from our analysis of 2.8 million online mentions and over 14 million interactions. 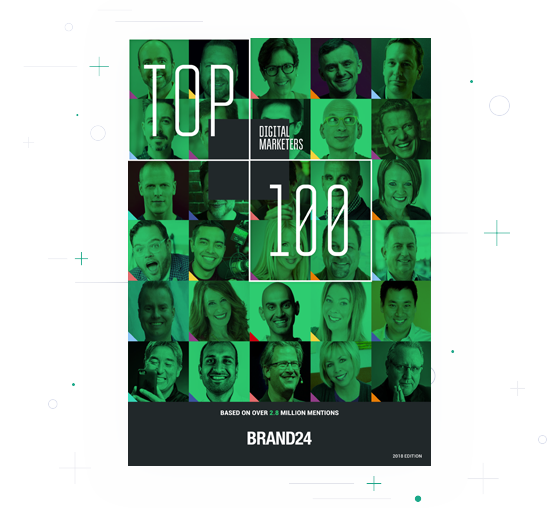 Access all the data inside the Top 100 Digital Marketers 2018. Our top 5 digital marketers may have different fields of expertise, but they are all pros at identifying, engaging, and captivating their online audiences. Just look at their numbers. The most mentioned man in our ranking, Gary started a wine business with his family and grew it from $3M to $60M in just five years. He now runs digital agency VaynerMedia. He is also a prolific angel investor and venture capitalist, investing in companies like Facebook, Twitter, Tumblr, Uber, and Birchbox. Seth is a popular author of 18 international bestsellers, which have been translated into more than 35 languages. He writes about the post-Industrial Revolution, the way ideas spread, about marketing, quitting, leadership, and most of all, changing everything. The author of titles such as Linchpin, Tribes, The Dip, and Purple Cow. Tim is an early-stage technology investor and advisor for Uber, Facebook, and Shopify. He’s the author of five #1 NYT and Wall Street Journal bestsellers, including The 4-Hour Workweek and his latest, Tribe of Mentors. Tim is referred to as the “Oprah of audio” by The Observer, due to the widespread influence of his podcast, The Tim Ferriss Show. Neil is a cofounder of Crazy Egg, Hello Bar, and KISSmetrics. He helps companies like Amazon, NBC, GM, HP, and Viacom grow their revenue. The Wall Street Journal called him a Top Influencer on the Web. Entrepreneur credits Neil with creating one of the 100 most brilliant companies in the world. Guy is the chief evangelist of Canva and author of 13 bestselling books. He is on the board of trustees at the Wikimedia Foundation, a brand ambassador for Mercedes Benz USA, and an executive fellow at the Haas School of Business (UC Berkeley). Former chief evangelist of Apple, Guy is an expert on innovation, entrepreneurship, social media and marketing. Who are the top 100 digital marketers of 2018? Tell us who your top digital marketers are by contacting our Global Community Manager at: magda@brand24.com or @brand24 on Twitter.